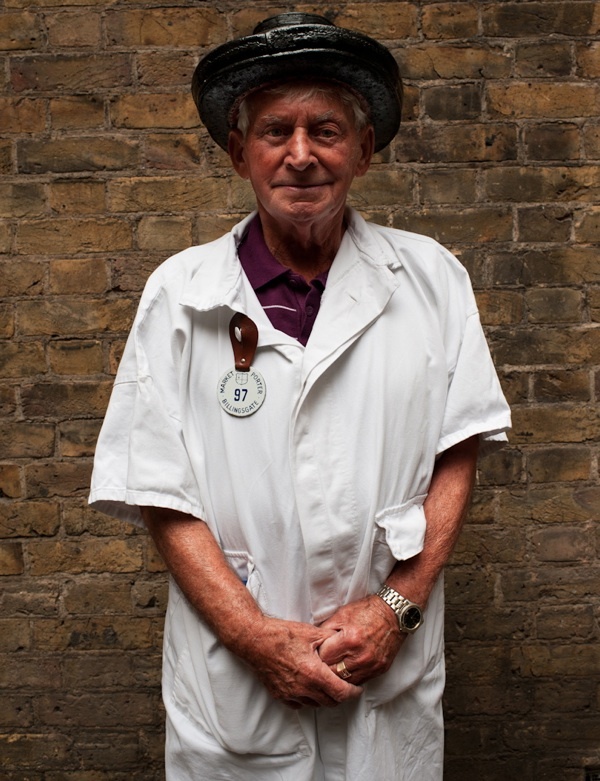 The market itself may have moved out to the Isle of Dogs in 1982, but that does not stop the senior porters and fishmongers making an annual pilgrimage back up the cobbled hill where, as young men, they once wheeled barrows of fish in the dawn. 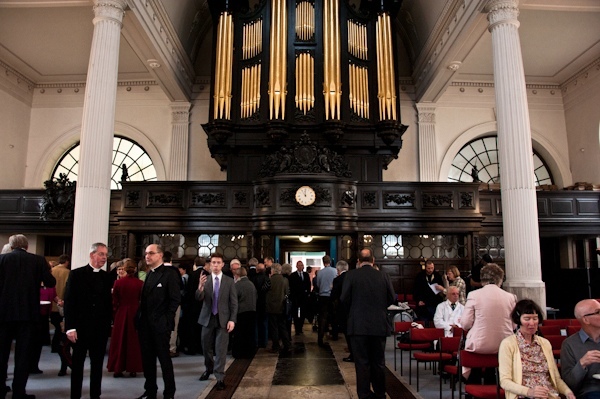 For one day a year, this glorious church designed by Sir Christopher Wren is recast as a fishmongers, with an artful display of gleaming fish and other exotic ocean creatures spilling out of the porch, causing the worn marble tombstones to glisten like slabs in a fish shop, and imparting an unmistakeably fishy aroma to the entire building. 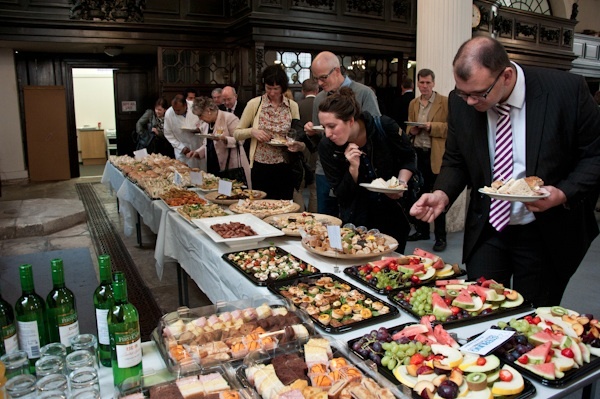 Yet it all serves to make the men from Billingsgate feel at home, in their chosen watery element – as Spitalfields Life Contributing Photographer Ashley Jordan Gordon and I discovered when we went along to join the congregation. 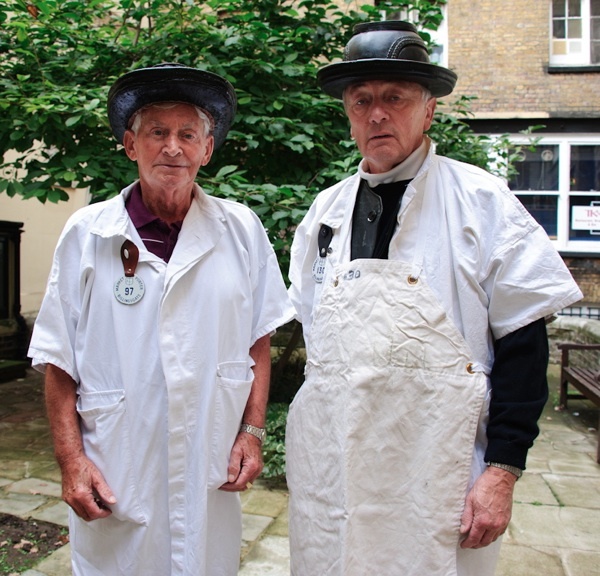 Frank David and Billy Hallet, two senior porters in white overalls, both took off their hats – or “bobbins” as they are called – to greet us. 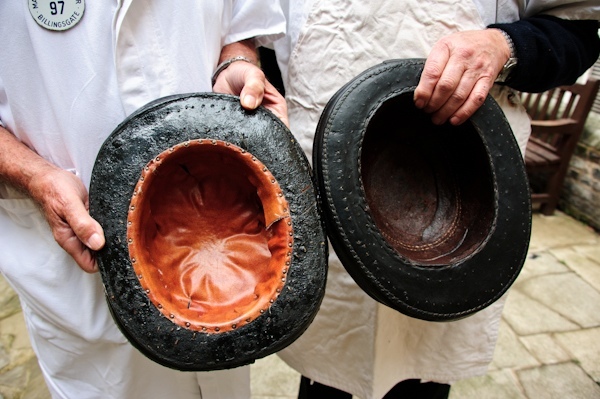 These unique pieces of headgear once enabled the porters to balance stacks of fish boxes upon their heads, while the brim protected them from any spillage. 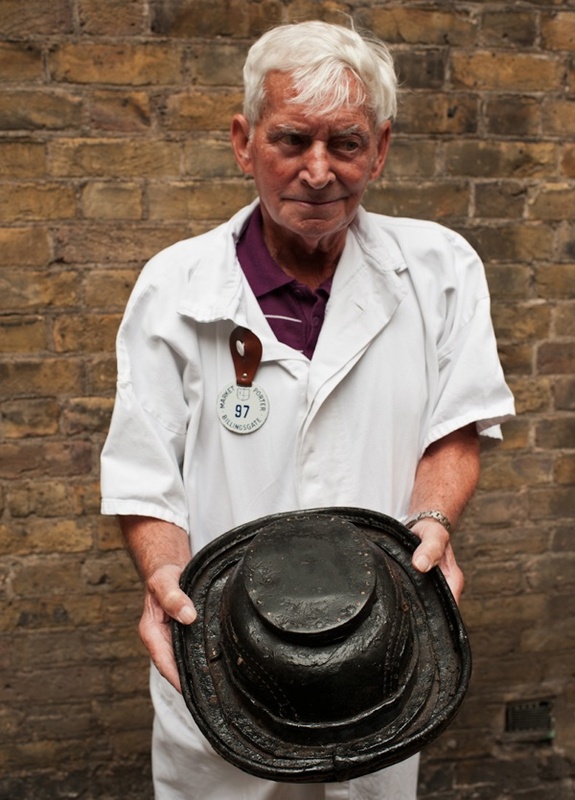 Frank – a veteran of eighty-four years old – who was a porter for sixty years from the age of eighteen, showed me the bobbin he had worn throughout his career, originally worn by his grandfather Jim David in Billingsgate in the eighteen nineties and then passed down by his father Tim David. 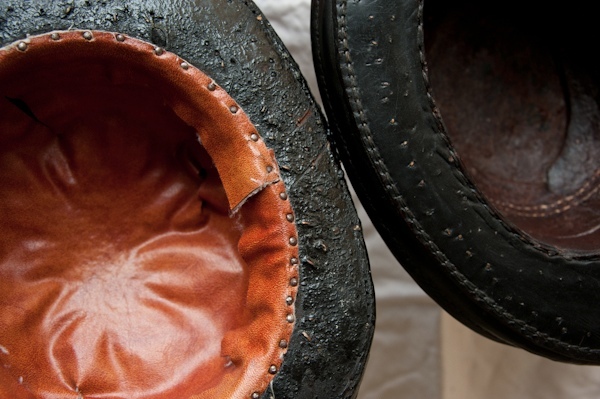 Of sturdy wooden construction, covered with canvas and bitumen, stitched and studded, these curious glossy black artefacts seemed almost to have a life of their own. “When you had twelve boxes of kippers on your head, you knew you’d got it on,” quipped Billy, displaying his “brand new” hat, made only in the nineteen thirties. A mere stripling of sixty-eight, still fit and healthy, Billy continues to work at the new Billingsgate market driving a fork lift truck, having started his career at Christmas 1959 in the old Billingsgate market carrying boxes on his bobbin and wheeling barrows of fish up the incline past St Mary-at-Hill to the trucks waiting in Eastcheap. Caustic that the City of London is revoking the porters’ licences after more than one hundred and thirty years, nevertheless he is “hanging on” as long as he can. “Our traditions are disappearing,” he confided to me in the churchyard, rolling his eyes and striking a suitably elegiac Autumnal note. 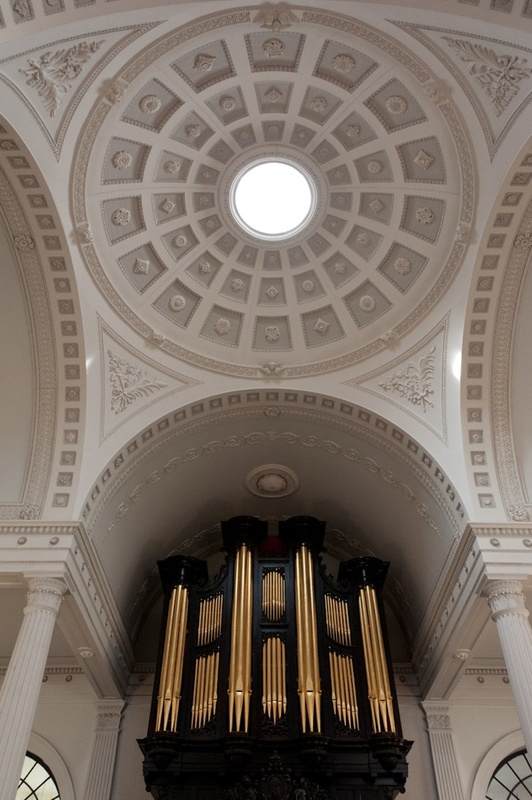 St Mary-at-Hill was rebuilt by Sir Christopher Wren in 1677. 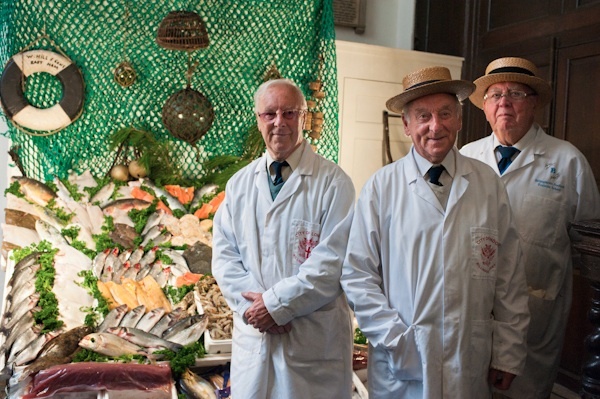 Senior fishmongers from Billingsgate worked from dawn to prepare the display of fish in the church. 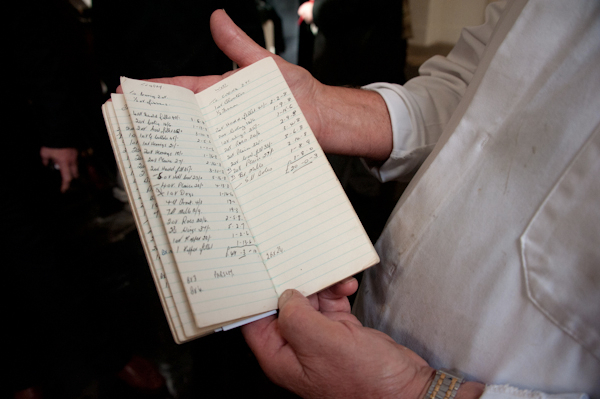 Fishmonger Charlie Caisey’s market book from 1967. 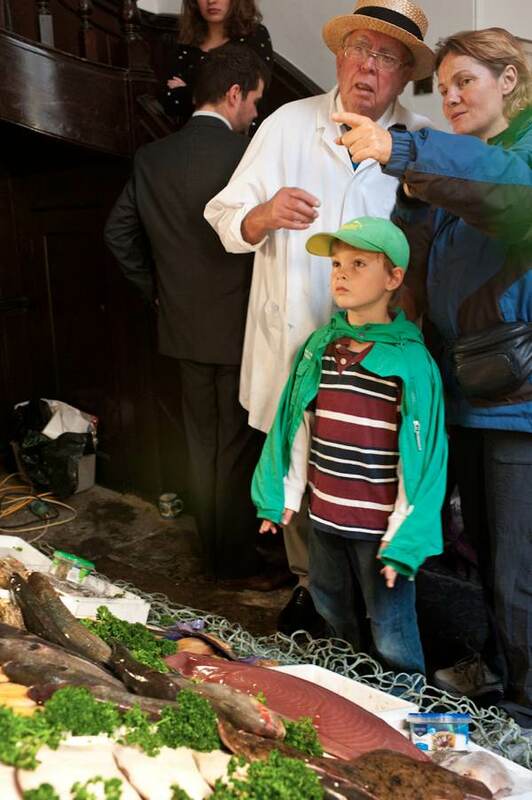 Charlie Caisey explains the varieties of fish to the curious. 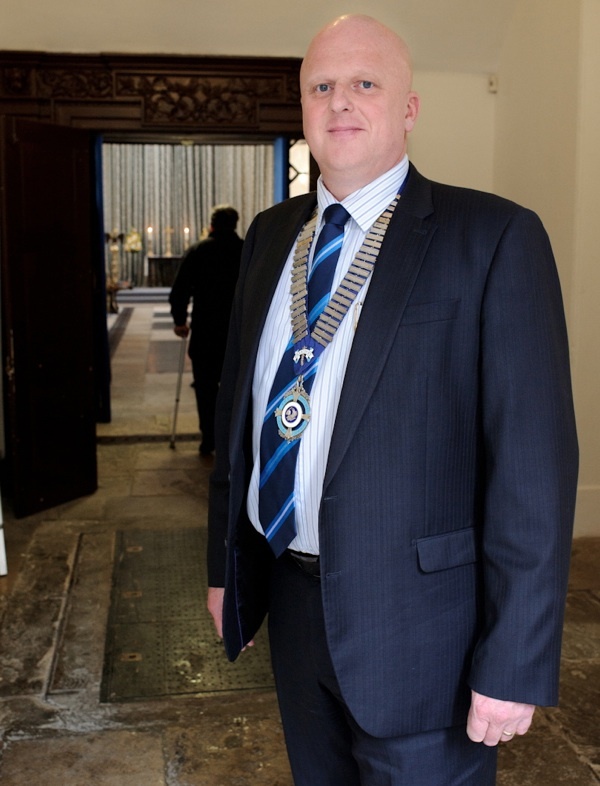 Gary Hooper, President of the National Federation of Fishmongers, welcomes guests to the church. Frank’s “bobbin” is a hundred and twenty years old and Billy’s is “brand new” from the nineteen thirties. 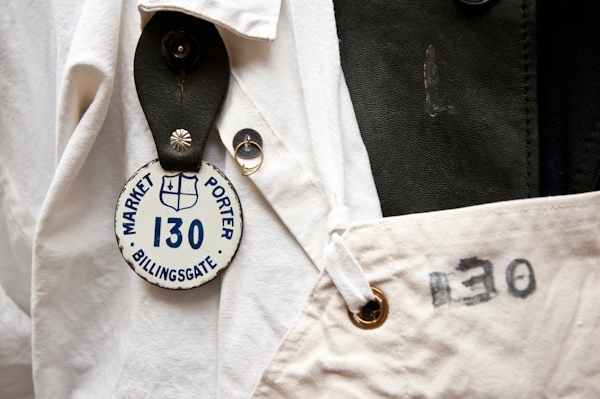 Billy Hallet’s porter’s badge, soon to be revoked by the City of London. 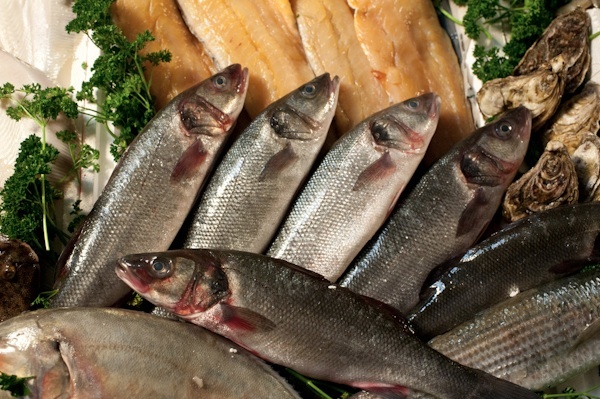 Jim Shrubb, Beadle of Billingsgate with friends. 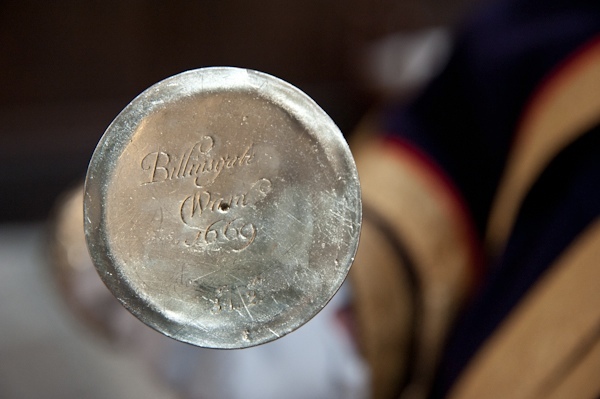 The mace of Billingsgate, made in 1669. 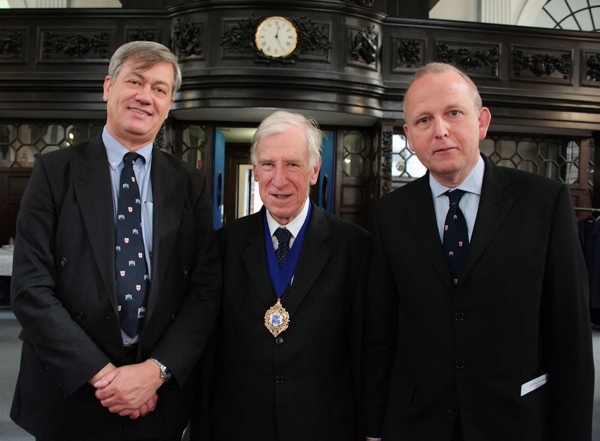 John White (President & Alderman), Michael Welbank (Master) and John Bowman (Secretary) of the Billingsgate Ward Club. Crudgie, Sailor, Biker and Historian. 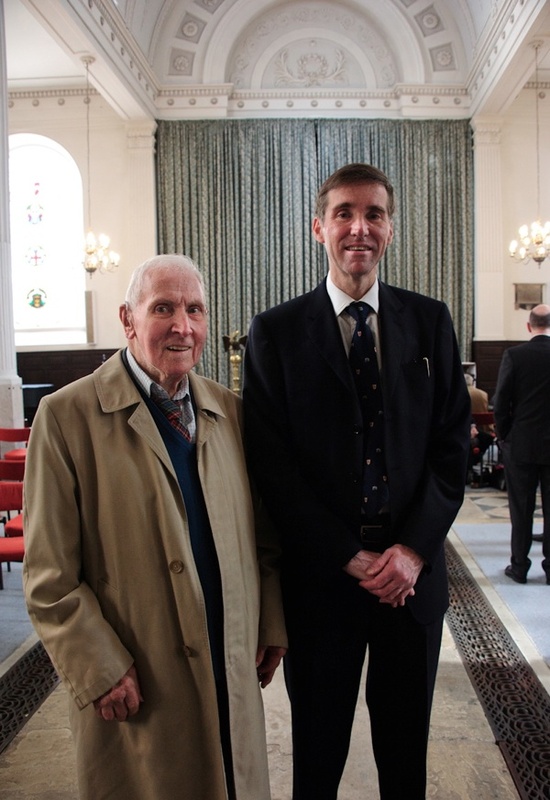 Dennis Ranstead, Sidesman Emeritus and Graham Mundy, Church Warden of St Mary-at-Hill. 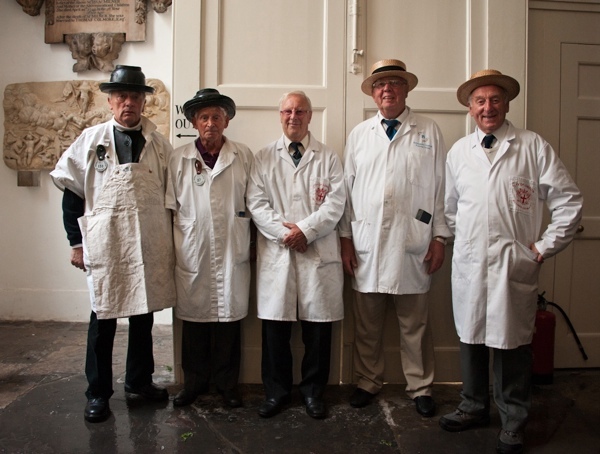 Senior Porters and Fishmongers of Billingsgate. 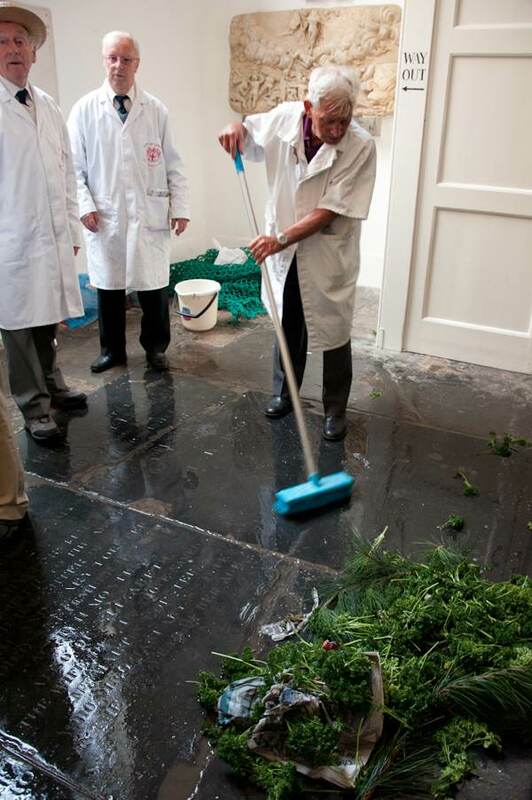 Frank sweeps up the parsley at the end of the service. 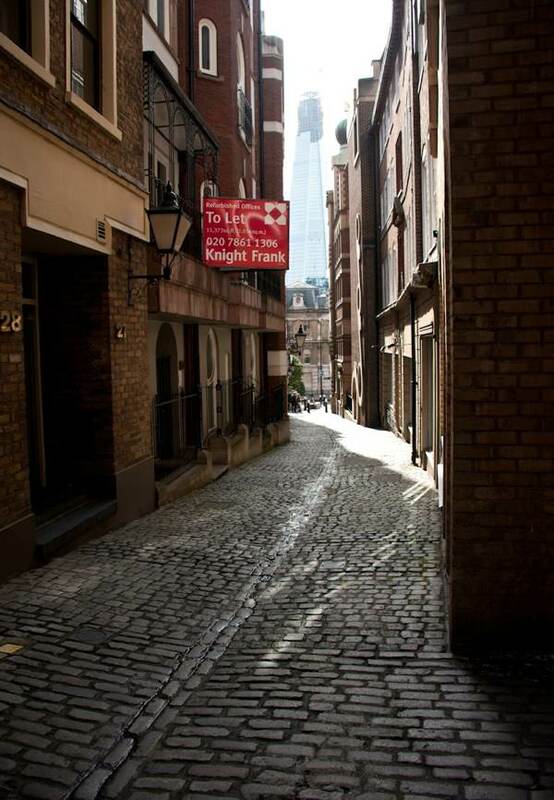 The cobbled hill leading down from the church to the old Billingsgate Market. Frank David with the “bobbin” first worn by his grandfather Jim David at Billingsgate in the 1890s. Who on earth is the man in your pictures named Crudgie? 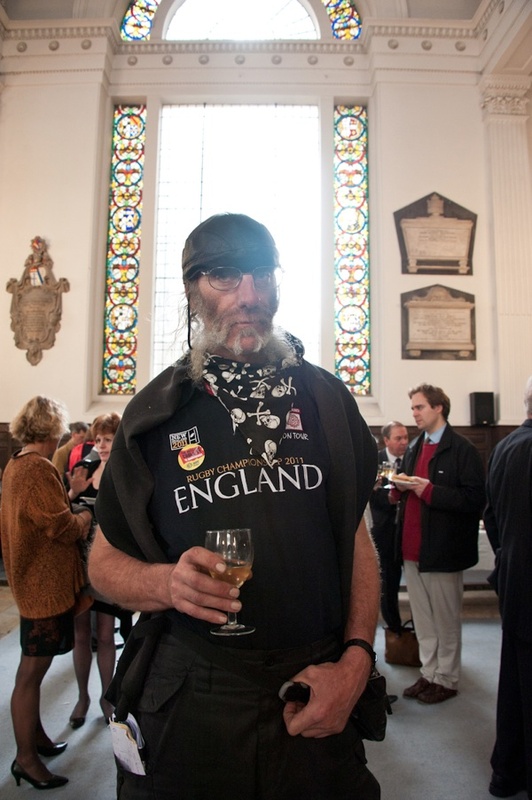 The Sailor, Biker and Historian? An intriguing gap in this post. Tell us more about him. 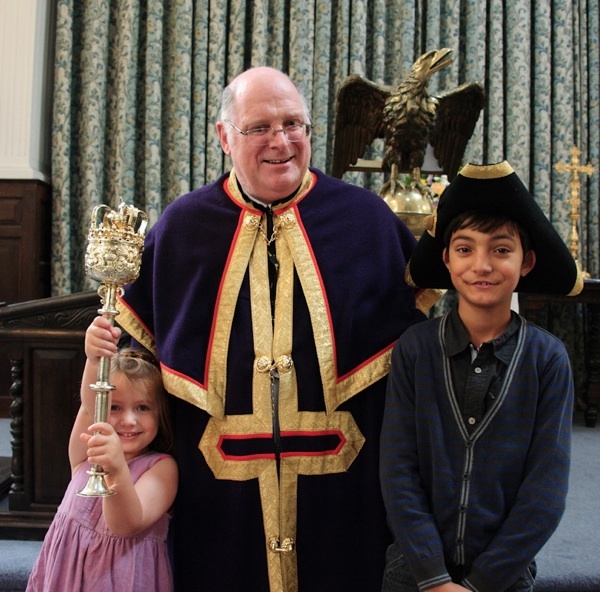 He looks somewhat a fish out of water at the harvest festival, or a different kettle of fish altogether. Great post as usual. Beautiful pictures. 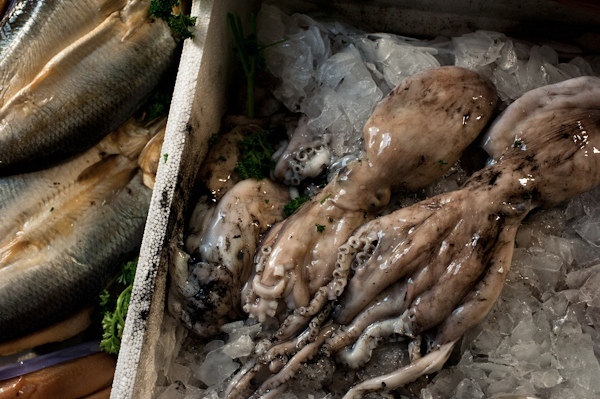 I shall forward on to my boyfriend, who is a fisherman down in Newhaven, East Sussex. 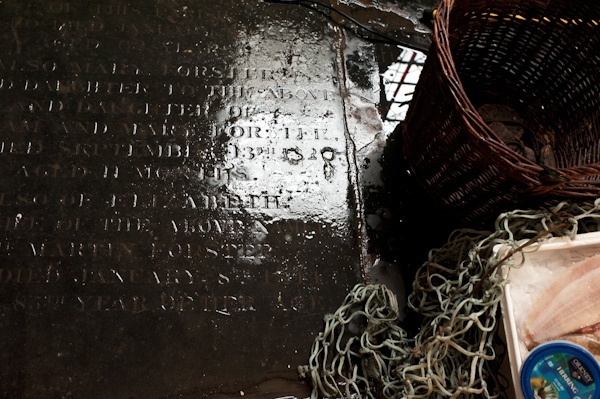 Lots of his fish ends up in Billingsgate Market, I’m sure, and he certainly does live a ‘life of peril’ on the sea. A wonderful piece of writing, with its careful descriptions and closeness to the subject. The photographs are tremendous of course but you seldom find prose as well balanced and beautifully crafted as this. It will clearly serve as a brilliant archive as well as a reminder of the times we live in today, much fuller of quirky character and meaningful stories than we might ever imagine without reading this. Also loved the Cafe story with the wonderful ninety year old. Let’s hope we can all look half as glamorous as that when we’re 70 never mind 10 years off the century. What an amazing life, so hard and so well captured, with its sad detail of lives lost through broken heartedness and children slipping into death – all in the context of the shock and loss of war. We all sang and prayed together as the church became a great lantern illuminated by shifting patterns of October sunshine, while the bones of the long-dead slumbered peacefully beneath our feet. The verses referring to “those who go down the sea in ships and occupy themselves upon the great waters,” and the lyrics of “For those in peril on the sea” reminded us of the plain reality upon which the trade is based, as we sat in the elegantly proportioned classical space and the smell of fish drifted among us upon the currents of air. i love that the ancient, perhaps immortal, porters and their immortal hats sit in the back near the fish, presumably, while the fur trimmed bobbins crowd to the front. This is great stuff for me to show my mum.She was born in bow in 1928 and moved to Hertfordshire during the war.Her Grandmothers maiden name was Godier,who we believe were fishmongers in the east end,going some way back. Kate if you can email me at oldgeezer21@hotmail.com or dp@australiancorporatewear.com.au I can send you a photo of Manny with Diana Dors at the market. It was taken around 1965.